Ohio Stadium was rocking, the Buckeyes were wiping the floor with a supposedly better Michigan program and yes, recruits were taking notice ... including Devell Washington. The Bay City (Mich.) wide receiver has been on multiple visits to Columbus since the Buckeyes offered him on June 25. But Saturday's visit was on a different level. I could feel the stadium shaking. It was the best environment I’ve ever been in," Washington said. "To be honest, this visit was in a class by itself. This one goes in the history books." That must be music to Ohio State's coaching staff's ears. Washington is a three-star receiver, ranked as Michigan's 13th-best overall prospect in the class of 2020. Standing at 6-foot-4, 200 pounds, he's a big target in which the Buckeyes could certainly utilize. During his time in Columbus, he got to meet up with some of his buddies and introduce himself to a certain NFL wide receiver. "[2020 Ohio State commit] Paris Johnson Jr., that’s my guy," Washington said. "I also got a chance to speak to [New Orleans Saints receiver] Michael Thomas. It was crazy because that's who I try to model my game after. He gave me some great advice." And he learned some things along the way. "The biggest thing I picked up is that, in that type of environment, you have to be ready," he said. "[Ohio State's] Chris Olave and I are cool, so to see him have the biggest game of his career as a freshman just shows you can be called on at any time." While Washington enjoyed his day in Columbus, so did Cincinnati Elder offensive tackle Jakob James, a three-star talent in the class of 2020. James attended summer camp at Ohio State and has made several visits to campus since. He has yet to receive an offer from the Buckeyes but does have standing offers from Boston College, Cincinnati, LSU, West Virginia and Pittsburgh, among others. "The atmosphere was phenomenal. Not only before the game but for all four quarters. The Shoe is definitely a special place to play," James said. "I’ve been to camp twice, up for a practice and, including yesterday, two games. It was definitely different from all those other experiences. Just to be around the team and coaching staff for their biggest game of the regular season was awesome." Yes, Michigan was in town. But one of the reasons that Saturday's game was so important in a recruiting sense is because of the conversations that happen off the field. 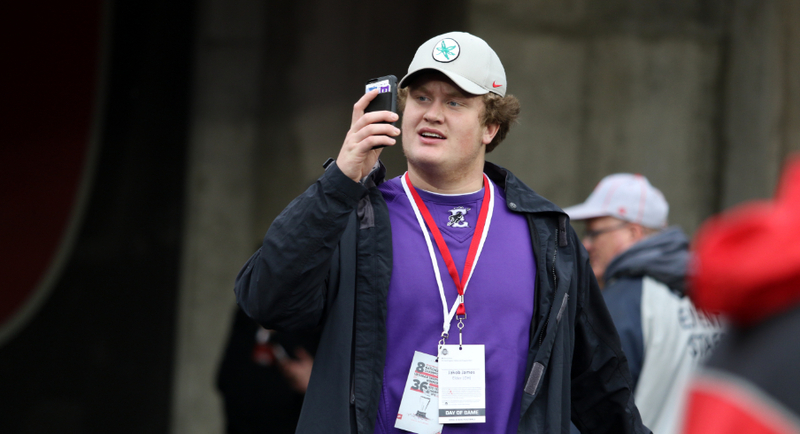 Elder's Jakob James made one of many visits this year to Ohio Stadium, Saturday. "I had a lot of great conversations with other recruits and coaches," James said. "Got to catch up with some familiar faces I saw throughout the season and that was nice. Coaches wise, I got to talk to some of them before the game. But just seeing them around the facility and how excited they were for the game was just awesome." And, like Washington, James also learned some valuable lessons. "I’d say the biggest takeaway I had from [Saturday] would be I see why it is so special to be a Buckeye," he said. "Yesterday I realized how much that rivalry means to them. Not only do they have great coaches and a great fan base, but to participate in a game like that, it’s a big reason why you go to Ohio State. They emphasize it so much. They don’t only prepare for that game the week of... they train all year for that game and that is just something special to me." With Ohio State target and teammate Maliq Carr by his side, 2019 quarterback commit Dwan Mathis also made a visit Saturday. Mathis, who pledged to Urban Meyer and company on June 24, is a four-star prospect out of Oak Park (Mich.) that's ranked as Michigan's seventh-best overall prospect in his class. "It was amazing. That’s the loudest I’ve ever heard the crowd," Mathis said of Saturday's atmosphere. "I enjoyed talking to [2019 Ohio State commit] Lejond [Cavazos] and a couple of my other teammates." Mathis said that even though he didn't have the chance to speak to many of the recruits in attendance, he did hear that "a couple we're going to commit." As for Carr, a three-star receiver in the class of 2020, Mathis said the two are like brothers and that Carr "just makes plays when needed." Mathis would know. He's Carr's quarterback. Could that close relationship between the two mean Carr is also headed to Columbus? Time will tell. Upon his time in Columbus Saturday, 2021 inside linebacker Branden Jennings received an offer from Ohio State. The Sandalwood (Jacksonville, Fla.) product posted the announcement on Twitter Sunday morning, saying "Truly blessed to receive an offer from The Ohio State University!" Jennings has yet to receive a composite rating but according to 247Sports, is a four-star linebacker ranked as the state's 11th-best player in his class. He's listed at 6-foot-3, 200 pounds and has offers from Florida State, Miami (FL), Louisville, Tennessee, UAB and USF.